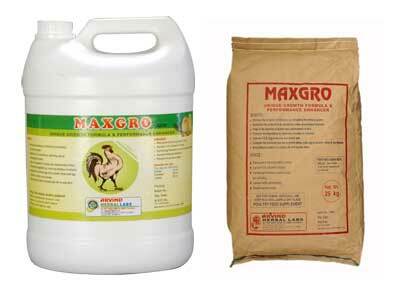 We offer Maxgro Powder, an ideal poultry feed supplement that is fed to the Chicks, Broilers, and Layers to enhance their growth and performance. Minimise the incidence of infections by stimulating the immune system. Maximizes the productivity by optimizing various physiological functions. Helps in the digestion of protein and carbohydrates of feed. Promotes the digestibility by improving utilization of nutrients. Complete the nutritional gap due to growth phase peak egg production, stress or any disease. Being Natural product it is totally safe with no side effect. Better growth & improving livability in chicks. Improves F.C.R. & Nutrients Utilization. Improves Egg Production in Layers & weight gain in Broilers. Prevent any kind of stress. Powder : Feed Inclusion Rate - 500 gm. per ton of feed or as required.